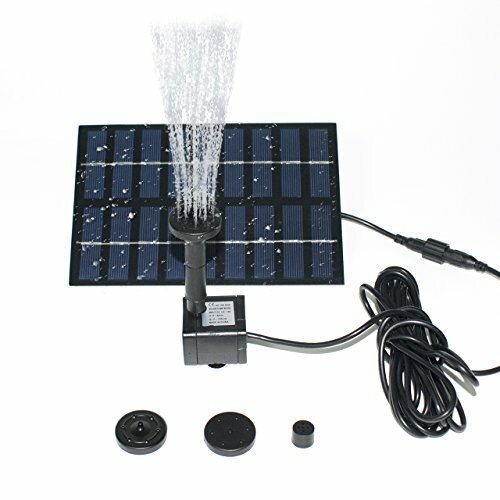 This solar bird bath fountain pump runs automatically, solar powered, no extra power needed, energy-saving and environmentally friendly. Starts working in 3 seconds once exposed to sufficient sunlight. Please make sure the solar panel is not shadowed and keep the filter intake on the bottom clear of debris. This solar fountain pump has more than 20,000 Hours of lifespan. And it has a built-in brushless motor that provides a longer service life and lower energy consumption. Comes with fitting accessories and 4 types of sprinkler heads for different water flows and water heights. Perfect for bird bath, fish tank, small pond, garden decoration, water circulation for oxygen. When it is sunny, it works and sprays high. Cool addition to my patio.